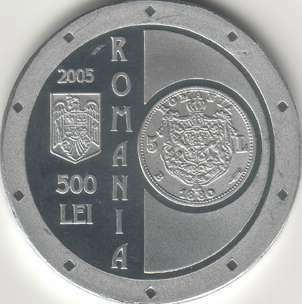 The pictures of the coin above are present on Romanian coins through the kind permission of Mr. J. Ardelean. 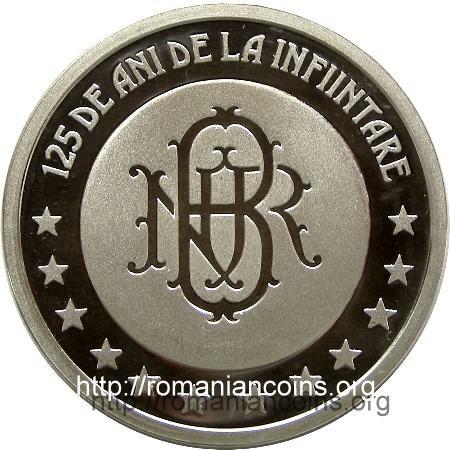 The Law for the establishment of a bank for discount and monetary issue "National Bank of Romania" was passed on April 17th/29th 1880 (with a capital of 12.000.000 lei). The bank had the sole privilege of striking coin, in the form of anonymous society with state participation (1/3 of the shares belonging to the state and the other 2/3 to individual share holders). The first director of NBR was Teodor Mehedinţeanu and the second was Eugeniu Carada. From January 1st/14th 1901 NBR became a private bank, the shares held by the state being sold to investors. 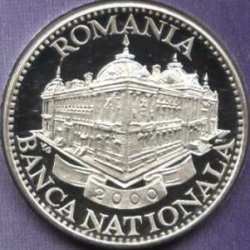 On January 1st 1925 the state became again proprietary to a fraction of NBR (Romania's History in Dates, Romanian Encyclopaedical Publishing House, 1971). On December 20th 1946 the Chamber of Deputies voted the law for the nationalization of NBR. 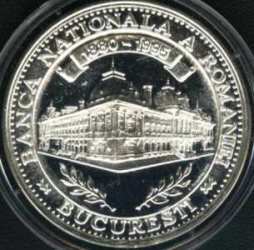 Accordingly to the circulation coin set pamflet in 2000, the initial capital of NBR was in amount of 30.000.000 lei and the state's withdrawal from the association to NBR took place on December 16th 1900 and the nationalization took place on January 1st 1947. 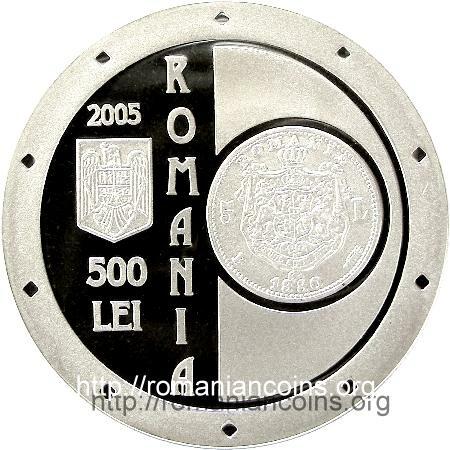 The aluminum essay pictures below are present on Romanian coins through the kind permission of Mr. Florin L.. 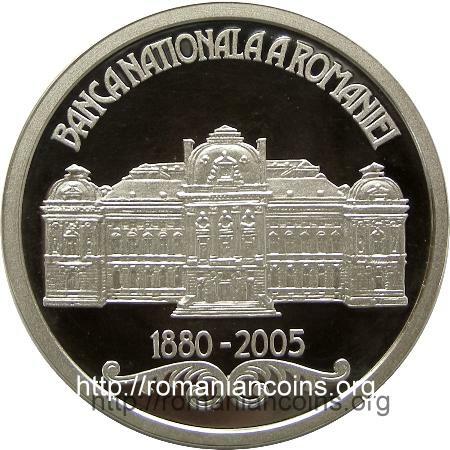 The National Bank of Romania's building in Bucharest was raised between 1883 and 1885, after the plans drawn up by French architects Albert Galleron and Cassien Bernard (Romania's History in Dates, Romanian Encyclopaedical Publishing House, 1971). 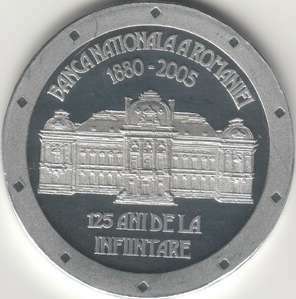 Accordingly to the circulation coin set pamflet in 2000, the NBR seat was built between 1884 and 1890. The building is of eclectic style with neoclassic elements, thus typical to the end of the 19th century. Two medals celebrating 115, 120 and 125 years of NBR existence can be seen in the images below, featuring the building from diferent angles. 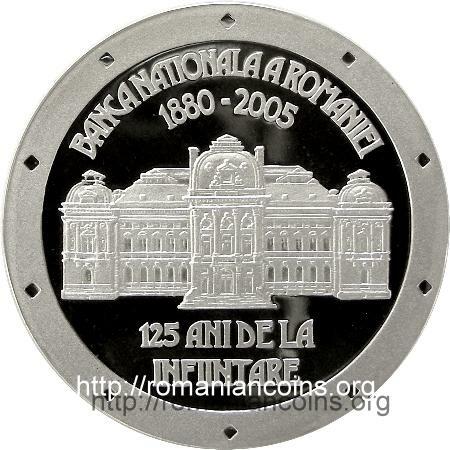 The pictures of the medal below are present on Romanian coins through the kind permission of Mr. J. Ardelean.